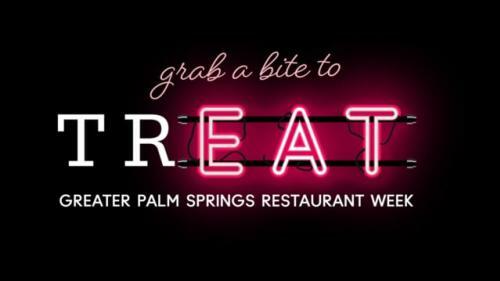 Greater Palm Springs Restaurant Week arrives May 31-June 9 marking its 13th year in the Coachella Valley. Greater Palm Springs, CA; March 26, 2019–The most-anticipated and flavorful culinary event in Southern California, Greater Palm Springs Restaurant Week or dineGPS for short, returns to the lush oasis May 31-June 9, 2019. Dining enthusiasts can plan a self-guided culinary tour with family and friends, getting a little taste of this year’s inventive menus at participating restaurants throughout Greater Palm Springs. During the 10-day event, many of the region’s finest restaurants and eateries will showcase their menu offerings with prix fixe menus. Restaurant Week Lunch menus offer 2 courses at $15, $20 or $25, and Dinner menus offer 3 courses at $29, $39 and $49. Some restaurants may offer wine pairings and/or supplemental dishes for an additional charge. A new component to the event this year will be focused on giving back to the community. For every reservation booked via the dineGPS website, $1 will be donated to FIND Food Bank - an organization that distributes 10+ million pounds of food assistance annually to an average 85,000 individuals each month across the Coachella Valley. For every $1 donated, FIND Food Bank is able to provide 7 meals. Greater Palm Springs Convention & Visitors Bureau (CVB) serves as the producing partner of Restaurant Week in collaboration with presenting sponsors Sysco™ and Agua Caliente Casinos. DineGPS is open to the general public and does not require purchasing tickets or passes to attend. Diners participating in the event are encouraged to tag social media posts with #dineGPS and @dineGPS. To learn more and see the list of participating restaurants, visit www.dinegps.com. Showcasing our culinary oasis, Greater Palm Springs Restaurant Week puts a spotlight on this nine-city destination’s varied dining experiences, celebrating the most beloved to some of the newest to hit this thriving local food scene. With special lunch and dinner menus at set prices, the week-long event encourages diners to explore new restaurants, menus and dishes and share great meal moments with friends, family and colleagues. The annual event, founded in 2007, has grown from fewer than 30 participating restaurants to more than 100. For more information, visit www.dineGPS.com. For each Restaurant Week reservation booked on dineGPS.com, $1 will go to FIND Food Bank. Greater Palm Springs is Southern California’s most storied desert oasis, comprising nine distinct cities—Palm Springs, Desert Hot Springs, Cathedral City, Rancho Mirage, Palm Desert, Indian Wells, La Quinta, Indio and Coachella. From international film, sporting and music events to over 100 golf courses and more than 300 sunny days annually, Greater Palm Springs presents a unique combination of escape, adventure, and relaxation. For more: www.visitgreaterpalmsprings.com. Sysco is the global leader in selling, marketing and distributing food products to restaurants, healthcare and educational facilities, lodging establishments and other customers who prepare meals away from home. Its family of products also includes equipment and supplies for the foodservice and hospitality industries. The company operates distribution facilities across a broad geographic presence serving approximately 425,000 customers. The Agua Caliente Casinos are the Coachella Valley’s foremost resort gaming destinations. The Agua Caliente Rancho Mirage is a AAA Four Diamond and Forbes Travel Guide Recommended property and is also home to the Forbes Four-Star Sunstone Spa and Southern California’s premier entertainment venue, The Show. The Agua Caliente Palm Springs is located in a fabulous resort setting in historic downtown Palm Springs at the site of the area’s natural hot water springs. Founded in 1983, FIND Food Bank is The Desert’s Regional Food Bank serving eastern Riverside County and southern San Bernardino County. From the high desert and Morongo Basin across the Coachella Valley, to the Salton Sea, up to Anza and on to Blythe, FIND Food Bank is dedicated to relieving hunger, the causes of hunger, and the problems associated with hunger through awareness, education, and mobilization of resources and community involvement. Currently, FIND distributes approximately 10 million pounds of food annually (approximately 50% in fresh fruits and vegetables) through 140+ distribution sites, which includes 16 FIND mobile pantries and non-profit agency partners. Together, we feed an average of 85,000 people every month across our service area. FIND Food Bank is the desert’s Feeding America partner and is a member of the California Association of Food Banks. To learn more about how you can help, please call FIND Food Bank at 760-775-3663 or visit FINDFoodBank.org.